We've spent the entire first week of school going over our procedures and getting to know our classmates and classroom layout. Now it's time to start our math and science lessons! This week in math we will be talking about finding the least common multiple (LCM) of two or more numbers. This is a topic you may have investigated in the past, but I want you to really think critically about what multiples are and how they can be used to help you solve problems you may encounter in your every-day life. You will have some LCM classwork and homework to complete as part of our lessons. Be sure you are writing your homework assignments daily on your workplan so you can remember to complete them. I will also post homework assignments, upcoming quizzes/tests, and due dates for graded items on the classroom calendar. Your classwork and homework will get you ready for a quiz on LCM this Thursday. Are you growing tired of this hot weather and looking for some extra practice with LCM? Cool off with this fun snowball fight game! 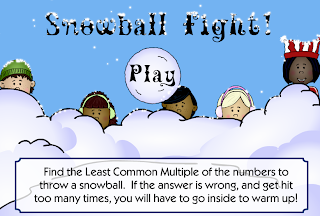 Click the picture to play the LCM Snowball Fight Game. To guide your studies concerning minerals, please complete the "Minerals Tic-Tac-Toe" sheet in class. you may choose any three activities as long as they are in a line (just like the game by the same name). As you complete each assignment, staple it to the back of the sheet, and place it into the box on my printer. I expect you to finish this choice sheet by next Friday (August 30). You will also have a test on what we studied concerning minerals on Friday, August 30. Your test questions will be taken from your note sheet we fill in during our lessons, the "fill in the blank" activity on the back of your note sheet, and your vocabulary sheet. It will take careful planning to complete your assignments and properly prepare for your vocabulary quiz and mineral test. It is imperative that you are focusing and working with good purpose. During our lab time in the afternoon, we will be mineral detectives and use the properties of minerals (color, luster, hardness, cleavage, etc) to try to identify mystery minerals. You may want to warm up your reasoning skills by trying out this virtual mineral identification lab! Click the picture to try a fun mineral identification lab.